Siemens Battery Tester Key Chain with hidden 2-battery storage tray. 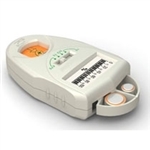 Pocketsize hearing aid battery tester with storage for two spare hearing aid batteries allows you to quickly test find out if your batteries are fully charged, anytime, any place. 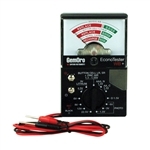 Wide Range Battery Tester for alkaline and rechargeable batteries. You can check just about any battery in the house. quickly tests all sizes of hearing aid batteries and lets you know how much 'juice' is left. with ergonomic finger grips and larger LCD window.